Aeration: Let Your Lawn Breathe. It’s gotta breathe! Sunshine, regular mowing, watering, fertilizing, and insecticide applications aren’t enough for a great lawn. Heartland Lawns™ covers the ground on turf health and vibrancy via lawn aeration. We use specialized equipment to systematically remove thousands of small plugs from the soil and deposit them on the grass surface. This gives your lawn a chance to “inhale” rich nutrients and flourish. Rule of thumb: No aeration = stagnant lawn growth. Lawn Aeration helps achieve a plush carpet of grass. At last! 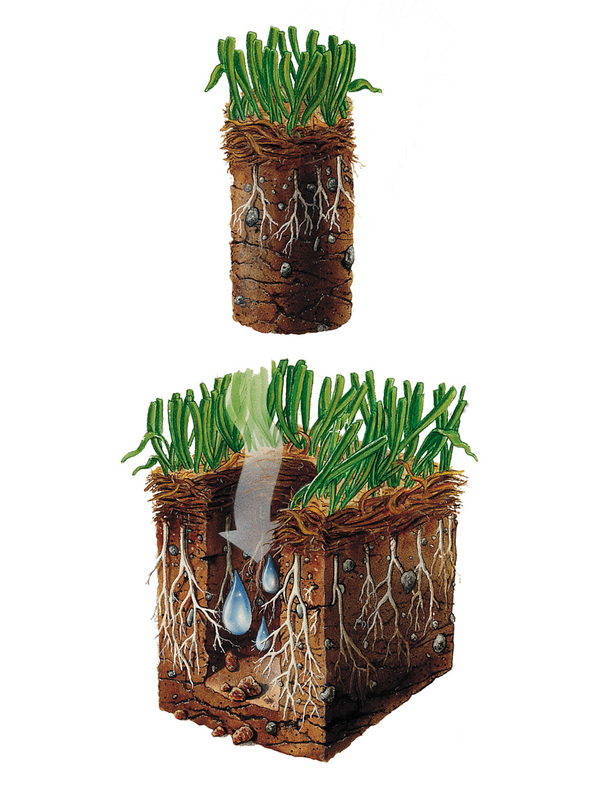 Our core removal process allows oxygen & water to reach roots, loosens up soil to promote growth, permits fertilizers to seep downward, and breaks up thatch – a layer of grass stems, roots, clippings & debris that decompose or over-accumulate over time. We highly recommend Lawn Aeration in late August, September or October. No worries. We charge a competitive rate. Lawn seeding is one of the most overlooked tasks necessary to keep turf thick and weed-free.. Heartland Lawns™ recommends annual fall overseeding for overall lawn health wellness! Lawn grass is not immortal. How can you tell if grass has passed? Check it. Spread the glass blades. If you see the soil, it’s time for renewal via overseeding. The best time for overseeding with blended bluegrass is early September or October, when days are warm and nights cool. Overseeding serves to make your lawn more resistant to disease, drought, and insects. 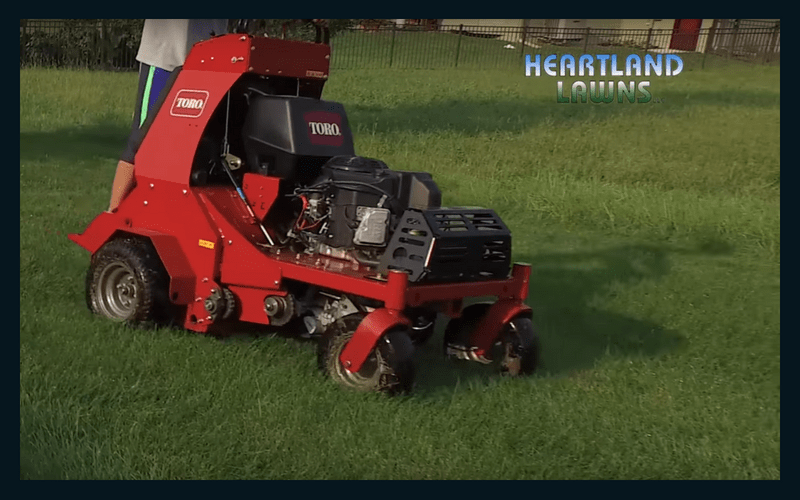 For best results, we suggest you let Heartland Lawns™ handle turf aeration first for good seed-to-soil contact. Why? The thousands of turf holes we’ve made create the ideal conditions for higher seed germination. Of course, afterward, water your lawn at least once a day for two weeks to achieve full seed germination! Ready for healthy, green grass? Contact us today for your free estimate.